As part of a recent 10-year anniversary celebration of SpaceX’s first successful launch to reach orbit, Falcon 9 B1047 was spotted undergoing inspections and refurbishment after the Block 5 booster’s launch debut, placing the 7-ton Telstar 19V communications satellite in orbit on July 22nd. Meanwhile, a bit north of B1047’s cozy Cape Canaveral refurbishment hangar, battered fragments of a Falcon 9 payload fairing half – part of the very same Telstar 19V mission – were discovered by a fisherman off the coast of South Carolina. Around nine minutes after lifting off from SpaceX’s LC-40 pad, Falcon 9 B1047 gracefully landed on drone ship Of Course I Still Love You (OCISLY), followed soon after by confirmation of Falcon 9 Block 5’s second launch success. Perhaps a tad toasty after what one might call a ‘medium-well’ reentry, the upgraded booster was otherwise perfectly intact. A minute after B1047 separated from Falcon 9’s upper stage and Telstar 19V payload, the fairing – tasked with protecting the satellite from the stresses of high-speed atmospheric flight – was jettisoned from the second stage, splitting into two halves and falling away from the rocket in order to save precious mass on S2’s push towards orbit. Falcon 9’s first stage separates from the upper stage for quite different reasons, cued quite literally by its propellant tanks essentially reaching “empty” – albeit an “empty” that typically includes some fumes for the booster’s safe recovery. The payload fairing, on the other hand, is detached from the second stage the moment that Falcon rises above a particular point in Earth’s atmosphere, only exposing its sensitive satellite(s) to the elements once in near-vacuum conditions. Ultimately, fairing halves separate from Falcon 9 at velocities significantly higher than that of the booster but are subjected to far more forgiving reentry conditions, requiring just a minimal of thermal protection to make it to (or just above…) the ground/ocean unscathed. By all appearances, B1047’s fairing halves both plummeted – unarrested – into the Atlantic, shattering into pieces of fragile carbon fiber-aluminum honeycomb. Thanks to the extremely lightweight nature of their composition, even waterlogged fairing fragments tend to float almost indefinitely, winding up in far-flung places many hundreds or thousands of miles from the point of impact. A particularly large fairing fragment from Telstar 19V clearly survived its greater halve’s violent ends, floating its way 600-800 miles northwest to the coast of South Carolina. After taking photos, the fisherman rather poetically let it float away, permitting it several more weeks of freedom before washing up on some shoreline and making its way onto eBay. 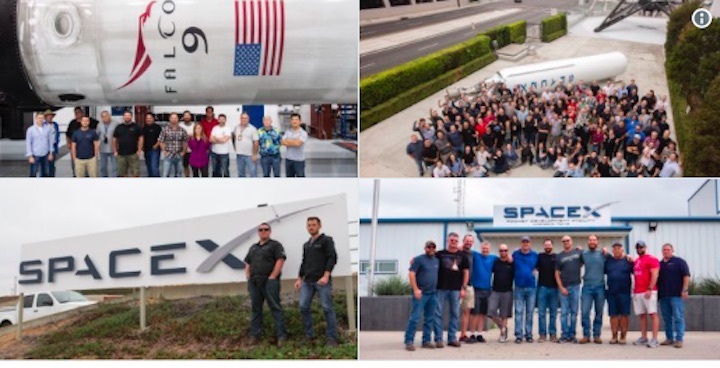 Ultimately, SpaceX engineers and technicians will continue to work towards successful, reliable, and routine fairing recoveries, inevitably experiencing many failures before a functional solution is found and optimized, just like the teams that brought Falcon 9 first stage recovery from blueprint to reality. In the meantime, serendipitous events like this will continue to serve as both stark reminders of the unforgiving hurdles along the path to orbital-class rocket hardware recovery and the undeniable fact that it already can and has been done before.